A luxurious nutrient-rich treatment formulated with fragrant Patchouli Oil and moisturizing Buriti Oil. 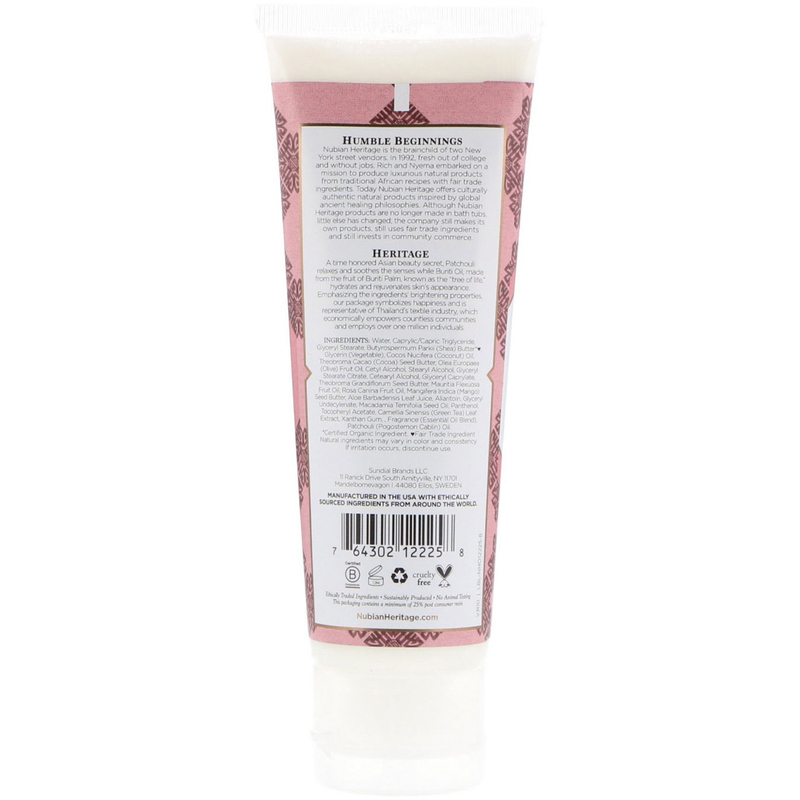 Shea Butter, Rosehip Seed Oil and Vitamin E hydrate, imparting hands with non-greasy moisture for soft, smooth and supple hands. Humble Beginnings: Nubian Heritage is the branchild of two New York street vendors. In 1992, fresh out of college and without jobs. Rich and Nyerma embarked on a mission to produce luxurious natural products from traditional African recipes with fair trade ingredients. Today Nubian Heritage offers culturally authentic natural products inspired by global ancient healing philosophies. Although Nubian Heritage products are no longer made in bath tubs, little else has changed, the company still makes its own products, still uses fair trade ingredients and still invests in community commerce. Heritage: A time honored Asian beauty secret, Patchouli relaxes and soothes the senses while Buriti Oil, made from the fruit of Buriti Palm, known as the "tree of life", hydrates and rejuvenates skin's appearance. Emphasizing the ingredients' brightening properties, our package symbolizes happiness and is representative of Thailand's textile industry, which economically empowers countless communities and employs over one million individuals.